The Problem: According to the American Nurses Association (ANA), massive reductions in nursing budgets, combined with the challenges presented by a growing nursing shortage have resulted in fewer nurses working longer hours and caring for sicker patients. This situation compromises care and contributes to the nursing shortage by creating an environment that drives nurses from the bedside. Studies have shown that in addition to being a leading cause of “nurse burnout,” high nurse-to-patient ratios have been associated with an increase in medical errors and patient stay, as well as patient infections, bedsores, pneumonia, MRSA, cardiac arrest, and accidental death. For each additional patient beyond 4 assigned to an RN, the risk of death increases by 7% for all patients. The Solution: Safe Staffing Ratios. 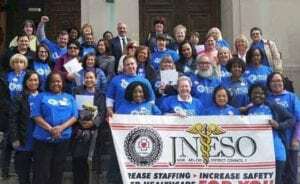 JNESO supports enacting safe nurse to patient staffing ratios to ensure patient safety and quality of care, to retain a qualified workforce, and to potentially address the growing nursing and healthcare professional shortage. To date, the first state to legislatively enact minimum staffing ratios continues to reap the benefits of an adequately staffed workforce with an increase in actively licensed RNs, a decrease in nurse vacancies, and a measurable difference in quality of patient care. A 2010 study by the University of Pennsylvania School of Nursing found that New Jersey hospitals would have 14% fewer surgical deaths if they enacted safe staffing ratios, while Pennsylvania would have 11% fewer. 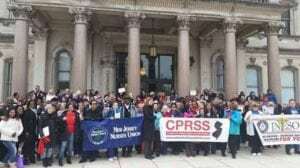 On Monday March 16th, JNESO led an historic charge for safe staffing ratios at the Statehouse in Trenton. More than 300 nurses and healthcare workers met with 22 legislators to talk about our support for a Safe Staffing law. While many of our meetings were positive, we still have a long road ahead and we need your help! WRITE A LETTER: To write a letter to your representative, visit: www.patientsafetycoalition.com. All you need to do is fill out your name, address, and email address -then click Sign. A support letter will be automatically sent to your State Senator and Assembly people. FILL OUT SHORT STAFFING FORMS: Continue to fill out short staffing forms! <Download JNESO’s Short Staffing Form> Short Staffing Forms play an important role when we talk to legislators about the problems that unsafe staffing ratios create throughout our hospitals. JOIN A STAFFING COMMITTEE! : Our efforts on staffing are not limited to the Statehouse, but they are happening at every local’s bargaining table. CLICK HERE to learn more about the staffing committee at your local and to learn about how you can help make safe staffing a reality to your facility. CHECK OUT OUR PICTURES: Visit JNESO’s Facebook page to “like” our page and check out the pictures from Lobby Day. See yourself in a picture? Tag it! Let’s keep our online Safe Staffing presence just as strong as our efforts in the Statehouse.